The quality of the tea leaves. The caffeine amount listed above represents the average amount one could expect to find. The Journal of Food Science recently tested some white teas and found a surprising range of caffeine in white tea. 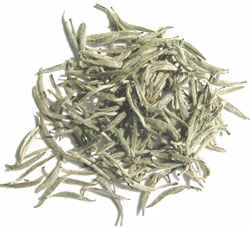 Popular Lipton Tea has a few white teas, but in actuality, none of them are pure white tea, but a blend of white, green, and fruit. Tazo White Tea lists 31-45 mg of caffeine. 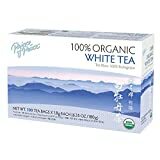 Uncle Lee's lists their Organic White Tea as 10-20 mg per cup and their Legends of China Organic White Tea as 20-30 mg of caffeine per cup. All this variation presents some problems for consumers who may be trying to watch their caffeine since some white teas can have very little caffeine while others can be some of the MOST caffeinated of the teas. How Does Tea (White) Compare? Tea (White) contains 3.50 mgs of caffeine per fluid ounce (11.83mg/100 ml).